Giving your child the power to make choices is an important strategy for any parent. It allows children to have some control over their own lives. Which in turn can help you avoid those dreaded power struggles. With controlled choices, children are given a limited set of options, any of which you are ok with them choosing. 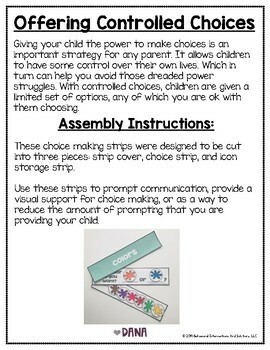 These choice making strips were designed to be cut into three pieces: strip cover, choice strip, and icon storage strip. 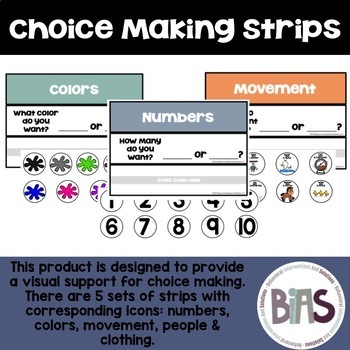 Use these strips to prompt communication, provide a visual support for choice making, or as a way to reduce the amount of prompting that you are providing your child. 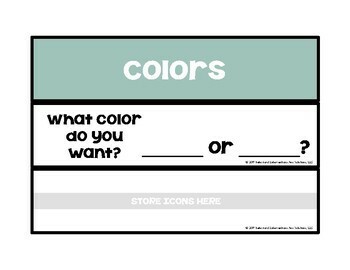 There are 5 sets of strips with corresponding icons: numbers, colors, movement, people & clothing.